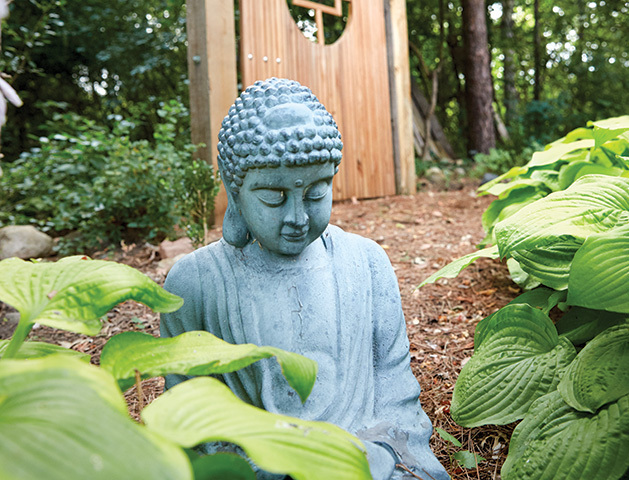 Woodbury neighbors bring Japanese-style gardening to their Minnesota backyards. Takuzo Ishida in his garden. 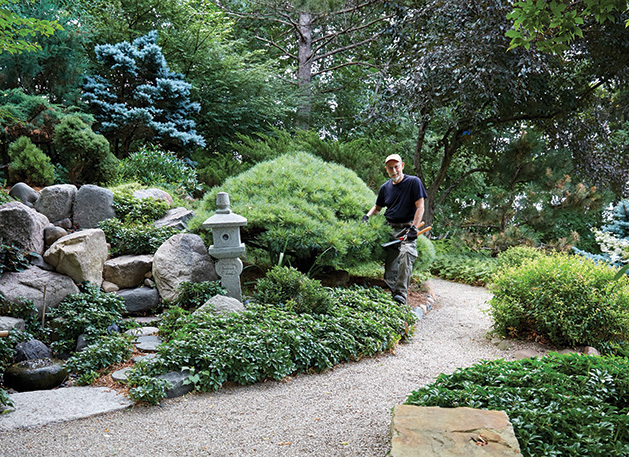 Woodbury residents Takuzo Ishida and Steve Shor have what many Minnesotan homes do not: Japanese gardens. 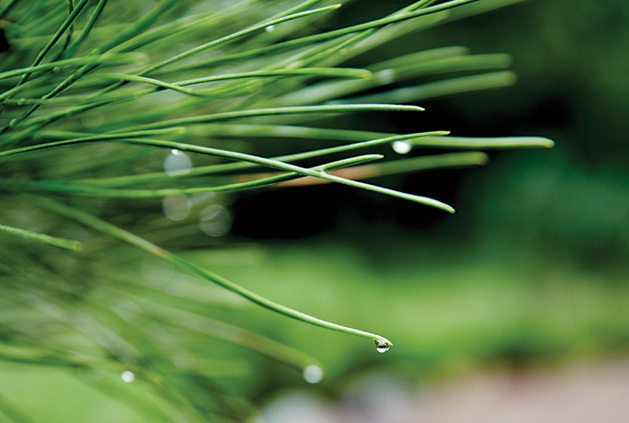 “The culture of bonsai is an ancient Japanese art,” Ishida says. “I began to grow bonsai when I was living in Japan in my 20s around 1970, and their cultivation has been my joy for almost 50 years now.” Bonsai uses cultivation techniques to grow small trees that mimic the shape and scale of full trees—sort of miniature versions of beautiful ornamental trees. 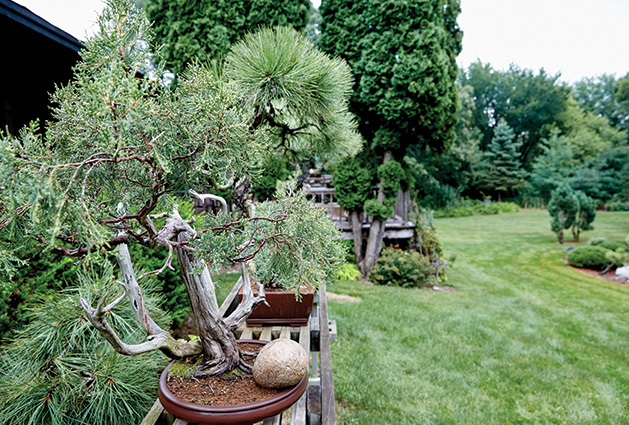 While bonsai cultivation and Japanese gardening are now large parts of Ishida’s life, he didn’t do very much gardening when he first moved to Minnesota from Japan. In the late 1990s, he realized that he wanted to take his interest and turn it into the hobby it has now become. The history of Japanese gardening goes back centuries, so styles have certainly changed during that time, with lots of different approaches. Ishida’s garden is based on the Nara and Heian styles of gardening, which were styles popular in Japan during the eighth and 12th centuries. “[The styles] look more natural and reflect wild nature without artificial materials,” Ishida explains. Japanese gardening is a hobby Ishida shares with his neighbor, Steve Shor. But in a wonderful coincidence, they started gardening independently and didn’t realize they shared the hobby until much later. The two worked together many years ago, and got to know each other. Then, Shor says, he learned that Ishida had a Japanese garden, too. Steve Shor in his garden. The style stayed with Shor. Locally, he would frequent the Minnesota Landscape Arboretum and Como Conservatory to look at their Japanese gardens. But when a friend of his started taking classes on how to shape and care for bonsai trees, Shor’s interest was able to take shape as he tried his hand at Japanese gardening for the first time. When Shor’s family moved to Woodbury in 1990, he was faced with all the possibilities of having a garden. But shortly after Shor retired and took a trip to China and Japan, he realized it was time to bring his idea to life. “It was not until 2014 that I decided to hire a landscape firm to re-grade my existing garden into a shape suitable for what is called a Japanese stroll garden,” Shor says. The process was lengthy but “fascinating,” according to Shor. “All of the existing boulders I had were moved down from the terraces to the bottom flat area. Most of my existing shrubs were removed and stored on the side.” After the yard had been cleared, Shor was able to go forward placing his boulders. “It is a good thing I was not paying by the hour, because some days only three boulders were placed,” he jokes. Once the stones were in place, the rest of the project moved along more quickly. “The stroll path was made, and all my old shrubs and perennials were dug in,” he says.